It is difficult to drive anywhere in Florida and not see the familiar signs of designated work zones along the roadways. Marked areas require drivers to pay close attention to safely navigate narrowed lanes, alternative routes and construction detours. It is imperative that you slow down to read new traffic signage and avoid workers who may be standing in harm's way. If you were injured in a work zone crash, contact an experienced Gainesville car accident lawyer at Schackow & Mercadante. 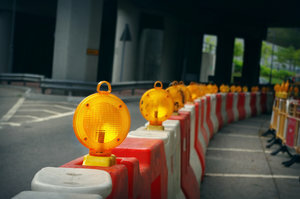 We help protect the legal rights of auto accident victims injured in Florida work zone collisions. Time of Day - 65% of the work zone crashes happened during the day. Day of Week - Majority of fatalities occurred on Tuesday, Wednesday and Thursday. Time of Year - More work zone fatalities happened between May-September. Alcohol as a Factor - Approximately 1/4 of fatalities involved alcohol. Speeding as a Factor - Excessive speed was a factor in 28% of fatal collisions. No Seatbelt as a Factor - Only 25% were wearing seat belts in fatal crashes. For 2015, there were an estimated 96,626 work zone crashes for an increase of 7.8 percent over the previous year. Although road construction workers appear to have much less protection in the event of a roadway crash, 85% of deaths in work zone crashes were drivers and passengers in cars. What Is Florida 511 Traveler Information System? The Florida Department of Transportation offers a Free* Florida 511 Traveler Information App that delivers real-time traffic conditions and travel incident reports to drivers' cell phones. Users can get detailed directions, travel times and alternate routes based on closures or delays for interstates, toll roads and other major roadways. An audible alarm can be set to alert you as to any crash occurring along your projected route. Drivers can also gain access to real time images from the agency's roadway traffic cameras. Simply select a county and a specific highway and you can see all of the active traffic cameras. The Florida 511 information service is accessible by mobile app, website, toll-free phone system and Twitter to notify drivers about current conditions and keep traffic moving safely and efficiently. *NOTE: The FDOT App is available free on Google Play and Apple App Store.